Many pedals simulate spring reverb, but few get this close to a Fender outboard unit. From the early 1960s, Fender's 6G15 outboard spring reverb unit set the standard for the effect, in particular defining the sound of surf guitar, and is still available if you have £800-plus and don't mind the large enclosure on top of your amp. 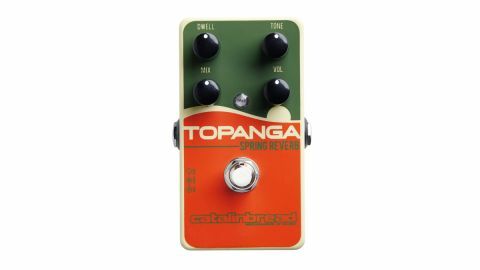 For a cheaper, more streamlined rig, Catalinbread has released the Topanga, which is designed to replicate those 6G15 sounds with similar Dwell, Tone and Mix knobs plus a volume knob that can add a flavour of the original's valves to boost your amp's front end. There's also a modulation mode, awkwardly entered by powering up with the tone knob at minimum, plus full wet capability at the extreme of the Mix knob. You can get Fender amp-style reverb from this, but it's the channelling of the crazed splashiness and presence boost of an outboard spring tank that make this stand out among reverb pedals.